Monday – Friday – 9:00am-5:00pm. If an Event falls on a Saturday, Sunday, or Holiday, the Box Office will be open at least 2 hours before doors are opened for the Event. Call the Box Office at 250-782-7443 for exact Show Day hours. Anyone with accessibility concerns or who requires accessible seating for an event, please contact the Tiger Box Office Plus directly at 250-782-7443. An online request form can also be found on all the event pages.All accessible seating needs are filled through the Tiger Box Office Plus. Click here for an accessible seating form. The Tiger Box Office Plus accepts VISA, MasterCard, American Express, Debit, Encana Events Centre Gift Certificates, and Cash. Personal and business checks will not be accepted. Remember, once tickets are purchased all sales are final. Keep in mind that the tickets that you purchase are the best available at that time, different seats may be opened at any time. There are NO refunds or exchanges. Animals or pets of any kind are prohibited in the venue with the exception of service animals for guests with disabilities. Service animals are welcome inside of the building and must remain on a leash or in a harness at all times. If you intend to bring a service animal to the building, please notify your ticket representative at the time of purchase or contact the Tiger Box Office Plus at 250-782-7443 so that an aisle seat may be reserved for you. Regular business hours are Monday to Friday; 9 a.m. – 5 p.m. If for any reason an event is cancelled, regardless of if it is re-scheduled, all customers are eligible for a refund at their point of purchase. If an event is cancelled or rescheduled, information is immediately sent to the local media for distribution and also placed on the Encana Events Centre website www.dawsoncreekeventscentre.com. In the case that an event is not rescheduled, all customers who purchased tickets with a credit card will be automatically refunded. Only customers who originally paid in cash will be issued a cash refund. All children over the age of two are required to have a ticket for any events, unless otherwise stated. Generally, children under the age of 2 are permitted to enter an event with a ticket holder, as long as they are able to sit on the ticket holder’s lap. Some events may require all children to obtain a ticket; this will be included in the individual event information. Please contact the Tiger Box Office Plus at 250-782-7443 for more information during regular business hours. Doors for an event generally open one hour prior to the start time. However, this can vary by event. Please check your ticket or contact the Tiger Box Office Plus for details. If an event falls on a weekday, the Tiger Box Office Plus is open at 9 a.m. Closing times for the Tiger Box Office Plus may vary on an event day, depending on the show. If the event falls on a weekend or holiday, the Tiger Box Office Plus is generally open 2 hours prior to the scheduled door opening time. For general information, please call (250) 782-7443. If tickets are lost or stolen you should immediately report them to the Tiger Box Office Plus at the Encana Events Centre. For stolen tickets, a copy of the police report must be presented to pick up replacement tickets. Lost tickets are similar to lost cash. If the Tiger Box Office Plus replaces lost tickets the tickets will only be available at will call on the day of the event by the original purchaser with photo ID and will be subject to a $5.00 per ticket reprint charge. Lost and found items are turned into the Tiger Box Office Plus and can be claimed anytime during regular business hours. Any lost and found items will be held for 30 days. To contact the Tiger Box Office Plus about any lost items, call 250-782-7443. There are four methods for purchasing tickets to events at the Encana Events Centre. You can visit the main Box Office location at the Encana Events Centre in Dawson Creek, B.C. Tickets can also be purchased over the phone by calling 1-877-339-8499 or online by visiting dawsoncreekeventscentre.com. The Encana Events Centre does not guarantee any tickets not purchased through one of these methods, or any tickets you may purchase from a third party. Should you purchase tickets that have been resold, you purchase these tickets at your own risk and we cannot guarantee entry to the event. Event announcements are made through media releases, social media and the Encana Events Centre website. Event announcements and notifications can be given through our VIP Club, My Entertainment, click here to join now. Discounted ticket prices for children are sometimes available for various events. Age restrictions and the amount of discount vary by event and are at the discretion of the touring act. If a child is 12 months or less in age and the accompanying adult is aware that the child will not have a seat, and will sit on the accompanying adult’s lap, generally, no ticket is necessary and entrance to the event is free of charge. Please contact the Tiger Box Office Plus at 250-782-7443 for more information. If you ordered tickets by phone or through the internet and did not receive them in the mail within 2 weeks of the event date, you should call the Tiger Box Office Plus at 250-782-7443. Have your ticket confirmation number ready and inform them you did not receive your tickets. Once you have phoned the Tiger Box Office Plus, your tickets will be available for pick up at the will call window on the day of show. Ticket scalping is not permitted on The Encana Events Centre property. Anyone caught doing so will be required to leave the premises. The Encana Events Centre does not guarantee any tickets bought through a third party. If you arrive with a scalped ticket, you will not be permitted access to the show unless you buy a new ticket through the Tiger Box Office Plus. The Tiger Box Office Plus at the Encana Events Centre will be open for any weekend public pre-sales or on-sales announced for the Encana Events Centre, all customers will be helped in the order in which they arrive, until the line has subsided or the show sells out of tickets. In the event that all tickets do not sell out, and all patrons in line have been helped, the Tiger Box Office Plus will remain open for 1 hour after the last customer leaves. Tickets purchased for will call can be picked up 48 hours from the time of purchase, during Box Office hours. Exceptions may be made if the tickets are purchased for will call within 48 hours of the show. Will call tickets can only be picked up at the main box office. Patrons must show government issued photo identification as well as the credit card used to purchase the tickets at the time of pick up. Only the account holder may pick up the tickets unless a name change has been processed prior to the time of pick up. Name changes must be done by visiting or calling the Box Office directly at 250-782-7443. Can I improve my odds for getting tickets by purchasing through one particular distribution channel? When an event goes on sale, tickets can be purchased online, by phone or in person. We do not reserve a specific amount of tickets for different distribution channels, so the odds of getting tickets are the same no matter how you choose to get your tickets. From time to time, promoters conduct “internet only presales” for their fan clubs or other promotions that are available via only one distribution channel. In such a promotion, you can only purchase tickets through that particular distribution channel. This is the only time that we suggest using another ticket distributor other than ourselves. Examples would be an official artist or band fan club or the show promoter, such as Live Nation. Our Cyber Club and social media streams (Facebook & Twitter) will share these for each show available. If you have any questions around the legitimacy of a site, PLEASE CONTACT US DIRECTLY prior to purchasing. Why do tickets sell out so quickly for popular events? When a popular event goes on sale there are literally hundreds and sometimes thousands of customers simultaneously attempting to purchase tickets across all distribution channels. Like any limited commodity, tickets are sold as long as seats are available, and sometimes they go quickly. If 500 fans are simultaneously buying four tickets each, 2,000 tickets can be sold in a matter of seconds! It’s the same reason why a typical 18,000-seat arena can sell out in a few minutes. Also, in many cases, tickets are held by the promoter or venue or have been pre-sold to season ticket holders, suite owners and premium club seat owners for the entire run of the event reducing the quantity of tickets available for purchase through the Encana Events Centre by the general public. …a few minutes after the event goes on sale? When customers find available tickets either online or through any of the other access points, those tickets are actually reserved while the customer considers the purchase. During that period, which lasts for only a few minutes, no one else can view or purchase those tickets. If the customer decides not to buy the tickets, they are “released” and become available to other purchasers. So if a customer is looking at 10th row centre seats and decides not to buy, those seats become available for another customer. …days after the event goes on sale? An artist, show, band or promoter may release more tickets for the venue to sell as the event date approaches. This happens for several reasons such as 1) The artist or team may no longer need the tickets that were held when the event originally went on sale, or 2) Once the stage or event area is set up, the venue has a better idea about which seats are obstructed. Sometimes events are so popular that even seats with obstructed views are released for sale! May I exchange my tickets if better seats become available later, or if a second show is announced? No. As with all Encana Events Centre ticket sales, there are no refunds, exchanges or cancellations. Why does the Encana Events Centre enforce a time limit when making purchases online? When you are shopping for tickets, you are “holding” real inventory. No one else can purchase those tickets unless you release them. Due to high demand, we’ve implemented a time limit during the checkout process. Each checkout page is assigned a different time limit based on the type of information we need from you. If you exceed the posted time on the page, the tickets you are holding are released for others to purchase. You have a limited number of time to complete your purchase. This gives as many people as possible a chance to purchase tickets. TIP: To speed through the checkout process, register your billing information and update it regularly online prior to purchasing tickets. You can do this by setting up a personal account on our site, by clicking on the round BUY TICKET BUTTON located at the very top, right-hand corner of every page. The venue artist, show or event management will typically impose a ticket limit per customer, credit card or address in order to provide ticket access to as many fans as possible. Ticket limits vary depending on the type of event or the anticipated demand for tickets. Check the event information area of the purchase page for more information on ticket limits for your event. Please adhere to published ticket limits. If we determine that a ticket limit has been exceeded, we will cancel an order, or part of an order, without notice, and may even cancel a ticket that has already been delivered rendering it unusable without notice. Please use only one browser window at a time (on the same computer) to hold tickets. If you open a new browser and order a different set of tickets, the tickets held in the previous browser will be released for sale to other customers. This helps us to prevent attempts to use automated programs to block other customers from getting tickets. As the event date approaches, the venue may release tickets that were previously held for the artist or show. Why are tickets released? The artist or show may no longer need the tickets that were held when the event originally went on sale. Once the stage or event area is set up, the venue has a better idea about which seats are obstructed. Sometimes events are so popular that even seats with obstructed views are released for sale! Why do we request your address, postal/zip code and or phone number? The information requested may be used for a variety of purposes related to the ticket purchase transaction. These purposes can vary by transaction, but include, for example, allowing us to: ship/deliver tickets and/or receipts; respond to customer service requests; review and enforce limits on the number of tickets purchased per event and to help prevent credit card fraud. Are there other ways I can purchase tickets to events I am interested in attending? Promoters sometimes conduct presales or special promotions. A presale typically occurs online a few days or weeks before tickets go on sale to the general public. A percentage of all tickets for the event are made available during the presale. Check our website often for new presales or register and sign up to be notified of upcoming special events. What is an Internet Presale? Internet presales are usually sold from an allotment of seats, which may not reflect the same availability during the public onsale. Internet presales provide the advantage of exclusive purchasing windows in advance of the public onsale, which often results in less people competing for the pool of available seats. However, Internet presales may also have limited seating available in various areas – these presales are intended as advance purchasing windows and do not necessarily provide access to better seating. In fact, it is possible that you may be able to obtain tickets for better seats at the general public onsale than those that you purchase through a presale. We must remind you that we do not offer refunds or exchanges, so you will not be able to replace the tickets you obtain at a presale with other tickets that subsequently become available. Why is it that sometimes I hear about an event that is supposed to go on sale, but when I call the Encana Events Centre or visit the website, they don’t know anything about it? Often, the venue or promoters prefer to wait until all terms about the event are finalized to protect the consumer from being misinformed. We don’t release any information until we receive authorization from the promoter or venue; sometimes, this can happen after the media has already begun publicizing the event. My tickets say “General Admission.” What does that mean? General Admission refers to seating or standing areas that are not assigned or reserved, and are occupied on a first-come, first-served basis. When purchasing tickets for a General Admission event, please ensure you carefully read the Event Information and Ticket Information screens when purchasing tickets: Any information on whether your tickets are General Admission will be posted on one or both of these screens. Seating arrangements vary for each event, and there may or may not be seats of any kind available. The Encana Events Centre cannot guarantee seating for any event that is sold as General Admission. Here’s a quick look at the anatomy of a ticket purchase. Artists, venues, and promoters provide the face price (or “base price”) of tickets. The per-ticket convenience and per-order processing fees vary by event. (Note: retail outlet and box office purchases usually don’t include an order processing fee.) We typically share these fees with the artist, or promoter. Our portion of these fees helps cover the substantial costs of providing the most convenient and safest ways to buy tickets, maintaining technology and taking and fulfilling thousands of orders a year. We offer fans several convenient delivery options, and whether fans pay this per-order fee depends on which option is available and selected at checkout. Delivery options include standard mail, Print-at-Home, XpressPost, and pick up at the Will Call window at the Encana Events Centre Box Office during business hours. Provincial, and federal taxes are typically included in the face value of the ticket. In some instances, however, taxes may be listed as a separate charge. The decision of whether or not to allow refunds is made by the show or promoter. The Encana Events Centre assumes no responsibility. However, if a refund is issued, then it will be the Encana Events Centre who will process refunds for those tickets sold through our Internet sites, call centres and retail outlets. Please note that delivery prices and certain other fees associated with a ticket order will not be refunded. Please see Tiger Box Office Plus for more details & venue FAQ’s. Occasionally, events are cancelled by the promoter, show, band or venue. Should this occur, and if you purchased your tickets online or through the phones, you may receive a refund or exchange for that event. Please note that delivery and order processing fees cannot be refunded. What if I don’t receive my tickets? If you do not receive your tickets by 3 business days prior to an event, call the Tiger Box Office Plus immediately. Be prepared with the confirmation number for your account, or the purchasing Credit Card. The agent will determine the nature of the problem, and if your tickets are replaceable, instruct you as to where and when to pick up your replacement tickets. This is normally done at the Box Office prior to the show, and the tickets are marked as “Replacement” so that they are easily identified as the valid tickets. Replacement tickets can only be picked up by the Credit Card holder with the original credit card used in the purchase. Find your local Order by Phone number to order by telephone. Encana Events Centre does not guarantee the authenticity of tickets purchased from any third party reseller (such as brokers or individuals). We recommend that you purchase tickets directly through the Encana Events Centre website or from the venue’s box office. 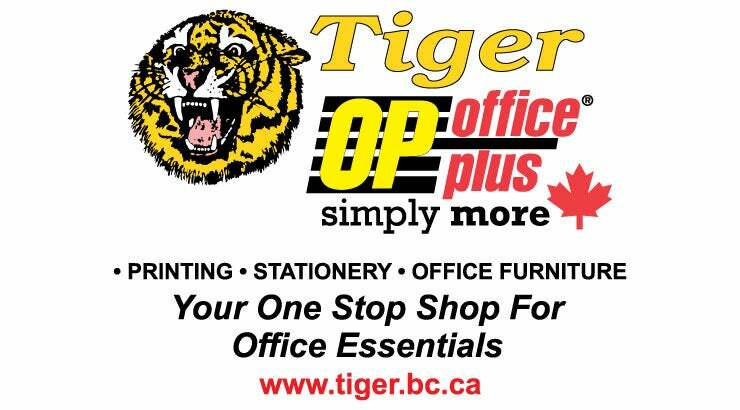 Authorized locations include, Tiger Printers & Stationers, and order by phone.